Have you ever stepped outside after dinner to walk the dog--just in time to see a bright fireball streak across the sky? It makes you wonder, how often does that happen? According to his calculations, fireballs as bright as Venus appear somewhere on Earth more than 100 times daily. 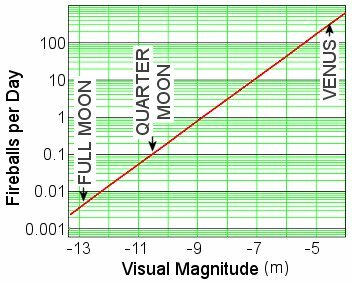 Fireballs as bright as a quarter Moon occur once every ten days, and fireballs as bright as a full Moon once every five months. The vast majority are never noticed. About 70% of all fireballs streak over uninhabited ocean. Half appear during the day, invisible in sunny skies. Many are missed, however, simply because no one bothers to look up. So grab a leash and a dog (optional), and head outside. The chance of a fireball is better than you think.